Besides the numerous main Samanayr species, there are also many sub-species. Most are compatible with each other in terms of breeding and forming Songs, but there are a few that have rivalries and problems. Origin: They appeared from North of the Sharians lands many years ago where they had fled human hunters and slavers. Samanayrs had been in hiding for so long that they were merely regarded as legend, and their small size helped them to escape detection. Once the first Samanayrs appeared and contacted the Sharians, more emerged from hiding. Special traits: Samanayrs are capable of numerous traits and mutations. The standard Samanayr appearance is four legs with large foot tufts, and equine mane and tail. Special markings/colors: Any markings, any colors. How to breed: 'Samanayr' is the default species when an individual doesn't have the required traits to be of another particular species. Origin: Appeared at around the same time as the Samanayrs, though there are noticeably fewer Lamanayrs. How to breed: When a Lamanayr is bred with a Lamanayr the foal will always be a Lamanayr. However, any Samanayr with the required Lamanayr traits can also be considered a Lamanayr, regardless of parentage. Notes: It is thought that Samanayrs and Lamanayrs were originally the same creature, but somewhere far in the past the original species was altered to create the other. This alteration was magical in nature, as it didn't happen long enough ago to mean that it evolved naturally. It is guessed that Samanayrs were the originally species, and that certain traits were added and altered for the Lamanayrs. Origin: After peaceful coexistence for a long while, long enough for mutual trust to build, the Sharians created Mystics for the Songs. Infused with magic, Mystics are a tremendous asset to Samanayrs and the Songs they associate with. Special traits: A very long strand of hair growing from behind each ear (called the mystic strands). Name is always 'Mystic of the (something) (something),' with the last two words referring to their magic type. For example, Mystic of the Living Earth controls earth magic, allowing her to find good grazing areas and also grow plants. Abilities: Mystics each control a particular magic type, the most common being earth, air, fire, and water. Some control more than one. All Mystics are also slightly clairvoyant. How to breed: Two Mystics have a 50% chance of producing Mystic offspring, who in turn inherit either one parents' magic type or both (in rare instances, a new type may be created). If a Mystic breeds with a non-Mystic, there is only a small chance that the resulting offspring will be Mystics. Breeding restrictions: A Mystic will not willingly join the same Song as or breed with a Misery or Sa'krien. Song effect: +10% breeding success rate (max +10% increase for entire Song). Notes: Some Mystics will remain with one Song, but most travel between the Songs, helping where they can. A Song with a resident Mystic is considered to be very powerful, and will often get the best grazing areas when they are in dispute. Any Samanayr species except for Misery, Mystery, or elemental is also capable of being a Mystic. Origin: A breeding experiment gone wrong, the first Miseries were bred by crossing a Sa'krien and a Mystic. Miseries have strived to expand their numbers ever since, and several more have resulted from Sa'krien and Mystic unions. Special traits: A mane that runs down the neck and back, joining up with the tail. Name is always 'Misery of the (something) (something),' with the last two words referring to their magic type. Special markings/colors: The color of the mane reflects the kind of magic the Misery controls. Abilities: Miseries each control a particular magic type, the most common being earth, air, fire, and water. Some control more than one. How to breed: A Misery has a small chance of being produced when a Sa'krien (usually a stallion) is crossed with a Mystic (usually a mare). The Mystic is rarely consensual. Miseries try to breed as often as possible in order to increase their numbers, but it's very difficult for them to find willing partners - normal Samanayrs do not want to add to their numbers, and Miseries cannot stand the company of each other, seeing each other as rivals. A Misery crossed with another species has a small chance of producing a Misery. Breeding restrictions: Miseries don't willingly join Songs. If you would like your Misery to join a Song and be able to breed normally, there is an RP requirement. Song effect: -10% breeding success rate (max -10% decrease for entire Song). Origin: There are very few Mysteries known to exist. All are considered thoroughly unnatural and have difficulty fitting into normal Samanayr society. Special traits: A mane that runs down the neck and back, joining up with the tail, and also two mystic strands. Name is always 'Mystery of the (something) (something),' with the last two words referring to their magic type. Special markings/colors: The color of the mane and mystic strands reflects the kind of magic the Mystery controls. Abilities: Mysteries each control a particular magic type, the most common being earth, air, fire, and water. Some control more than one. How to breed: A Mystery is the offspring of a Mystic and a Misery. Not only is this pairing extremely uncommon, but the odds of such a pairing producing a Mystery are minuscule. Not to mention that Mystics are generally able to repel a Misery's advances quite easily, and don't willingly breed with them. If you'd like a Mystic and Misery to join a Song or produce a foal together you do need to RP the pair on the forum. Breeding restrictions: This depends on the Mystery. If they lean more towards their Mystic side, they can create and join Songs like normal. Origin: Sibyls recently began to appear apparently spontaneously in breedings between Samanayrs with magical abilities. Their exact origin beyond that is unknown, although some say they were created by the Samanayr gods themselves. Special traits: All Sibyls have pure white eyes and the Stellar Crown trait - three long columns of hair growing from the head tipped with a single feather. The name is always 'Sibyl of the (something) (something),' with the last two words referring to their method of divination. Special markings/colors: The coloration of the Stellar Crown reflects their method of divination, e.g. shades of green for one who relies on plants. Abilities: Sibyls are able to divine the future using a preferred divination method, such as looking into a pool of water or watching the stars. The accuracy, frequency, and detail of the visions varies from Sibyl to Sibyl, and some find themselves unable to explain their visions to other Samanayrs. No Sibyl is perfectly accurate, or able to see into the future whenever they'd like, so while their advice and visions are still considered valuable they should always be taken with a grain of salt. How to breed: Sibyls occur spontaneously in breedings where both parents have magical abilities. The parents don't need to be the same species, but they do have to be able to control magic. The chance of a Sibyl being produced is very small, and is the same even if both parents are Sibyls. Notes: Unlike Mystics, Sibyls tend to remain fairly stationary and allow Samanayrs who would like to make use of their abilities to come to them. They prefer to join non-nomadic Songs so that any who need to come to them will be able to find them easily. Although a Sibyl generally isn't able to do a divination on demand, if a Samanayr puts in a request the vision that they're seeking may be granted to the Sibyl when the moment of divination is upon them. Origin: The origin of these strange Samanayrs is still uncertain - some say the Sharians had a hand in their creation, and others think they occur naturally. 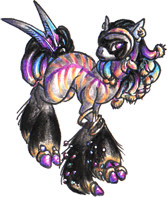 Special traits: An Elemental Samanayr displays physical traits, colors, and markings related to its element. For example, a Fire Elemental Samanayr has a mane and tail of flame, an Earth Elemental Sam might have a vine and flowers growing from its back, and so on. Which traits are expressed varies widely from Elemental to Elemental. The eyes are always a solid color and pupiless. An Elemental's name is always a single word, such as Flame or Wave. Abilities: An Elemental Samanayr controls magic related to its element. For some of the more odd elements - Vampire Elemental, for example - these magical abilities can become rather odd. Elementals are more or less steeped in magic. Availability: The common elements (earth, air, fire, water) are considered rare, other elements very rare. How to breed: Some Elementals are unable to breed due to physical limitations. Magic can sometimes be a factor if these Elementals want to reproduce. An Elemental will always occur when two of them are bred, and a partial Elemental occurs when only one of the parents is Elemental. New Elements seem to occur spontaneously and through breedings. Origin: This species appeared fairly recently. It's assumed they were created with the help of Sharian magic, but they seem unclear on their origins. 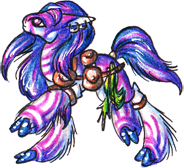 Special traits: A long mane strand growing from the back of the head with colors that reflect the shifter's environment. Special markings/colors: The mane strand is colored to match their environment, otherwise there is no particular coloration. Abilities: A Shifter is able to shapeshift into any of the animals in their particular environment, and their environment is determined by where they were born. A Shifter can hold their shape for about a day, and although they are able to shrink down to half their actual size, they cannot increase in size. How to breed: Breeding two Shifters together gives a 50% chance of producing a Shifter. A Shifter bred with any other species has a very small chance of producing a Shifter. 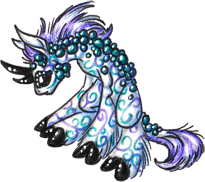 Origin: Glint of the Ice Prism was the first known Kirin, appearing suddenly at the Song of the Rainbow Hotsprings. He and the other Kirins have kept quiet on their exact origins. Special traits: Kirin ears, kirin horn, pure black eyes, scales, leonine mane, and tufted tail. Stallions can have a mane that runs down their belly. 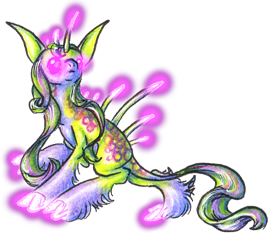 Abilities: Kirins have psychic abilities which vary from individual to individual and can include abilities such as telekineses, telepathy, and empathy. All Kirins have the ability to speak mind-to-mind to each other, and can speak into the minds of other Samanayrs if they are close enough (usually 10 feet away or less). All Kirins also have some level of empathic sensing, but not all can project emotions upon others. How to breed: A true Kirin is only produced when a Kirin is bred with a Kirin. Origin: Healers are another magical species that was created naturally, similar to Mystics. Unlike Mystics, however, Healers are incredibly rare, and there may only be a handful born every generation. Special traits: All Healers have a mane that runs down the throat instead of down the back of the neck. All Healers are female, and they have a name that starts with 'Healer,' such as Healer of Fallen Skies. Their name may or may not relate to their specific abilities. Special markings/colors: Tend to have muted coloration. Abilities: Each Healer has a deep grasp of Samanayr anatomy and a good knowledge of the healing plants in the area, but they are distinguished by their magical Healing abilities. They are able to use their magic to speed healing, and to heal wounds and sicknesses that could otherwise be fatal. Magical Healing draws its energy from the Healer, and so after a major healing is complete, the Healer usually has to rest for a day or two. How to breed: Healers are special in that they cannot join Songs. Were they to attempt to remain in one place, the urge to move on would be too great, and they would eventually end up leaving the Song. Instead, they wander from Song to Song, helping any who require assistance. Most Healers adore foals, and will have quite a few over the course of their lifetime. The father for each foal is usually different, for Healers do not join Songs and usually do not take mates. They look for good-hearted stallions, either unattached or Song leaders (though if a Song leader, permission is sought from the other mares first), to be the fathers of their foals. If she is lucky, one of a Healer's foals will be another Healer, but they remain extremely rare. Origin: These Samanayrs appeared out of the distant North rather recently, finally aware of the truce. They are now finding homes in warmer climates. Special traits: Very long and fluffy fur. Usually have short legs, large hooves, and small ears. Special markings/colors: Very pale coloration, mostly white, greys, and pale blues. How to breed: When a Northern is bred with a Northern the foal will always be a Northern. However, any Samanayr with the required Northern traits can also be considered a Northern, regardless of parentage. Origin: These Samanayrs came down from the jungle canopy one day, more or less. Another late-arriving species. Special traits: Long, prehensile tail, hooks instead of hooves. Special markings/colors: Generally 'foresty' colors - greens, browns, etc. How to breed: When an Aboreal is bred with an Aboreal the foal will always be an Aboreal. However, any Samanayr with the required Aboreal traits can also be considered an Aboreal, regardless of parentage. Origin: Another species that emerged from their isolated homeland, the desert. Special traits: Large ears, tufted tails, reduced foot tufts, large hooves. Many also have leonine manes. Special markings/colors: Dusty desert colors, and also warm fire colors. How to breed: When a Desert is bred with a Desert the foal will always be a Desert. However, any Samanayr with the required Desert traits can also be considered a Desert, regardless of parentage. Origin: The Aquatics remained hidden for a long while in their lakes and oceans, unaware that it was safe to come out. Some were finally contacted and spread the word to others. Special traits: Assorted fins and flippers, sometimes gills. They don't usually have normal hooves or legs that will bear them on land. Abilities: Most Aquatics are only able to breathe air, not water, but they can hold their breath for long periods of time. Aquatics that do have gills are able to breathe air and underwater. How to breed: When an Aquatic is bred with an Aquatic the foal will always be an Aquatic. However, any Samanayr that features one or more Aquatic traits (fins, flippers, etc) and spends the majority of their life in the water can also be considered an Aquatic, regardless of parentage. Notes: Aquatics and Water Elementals can be differentiated by the fact that the latter can breathe underwater with no visible gills. Origin: As this species originated from the far north, where few creatures and fewer Samanayrs live, their exact origins are unknown. It's thought that they adapted naturally, and they may have evolved this way before the scattering of the Samanayrs. Special traits: All Northern Aquatics have a thick layer of protective fat, making them appear very pudgy, with four flippers instead of legs and a powerful otter-like tail. They have velveted fur and small, rounded ears. A common additional trait is tusks. Special markings/colors: The colors are usually dull and muted, mostly reflecting the colors of the sea - white, green, blue, grey, and purple. 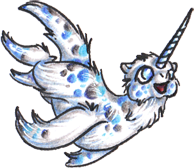 Abilities: Like Aquatics, they are only able to breathe air, not water, but they can hold their breath for long periods of time. They're also fairly comfortable on the land, although their flippers prevent them from moving too quickly. How to breed: When a Northern Aquatic is bred with a Northern Aquatic the foal will always be a Northern Aquatic. However, any Samanayr with the required Northern Aquatic traits can also be considered a Northern Aquatic, regardless of parentage. Origin: Illiayrs took refuge from the humans underground, finding a safe home in deep caves and tunnels. Through a combination of natural selection and some magical alterations they became as they are today. Special traits: All Illiayrs have very large, bat-like ears, and their manes and tufted tails are so usually long that they brush the ground. Long, flexible spines grow from the top of the back and run down the spine to the base of the tail. Their eyes, hooves, and the tips of the spines glow as a result of the consumption of phosphorescent lichen. The only wing type they can have is wing tines - these just appear very rarely. 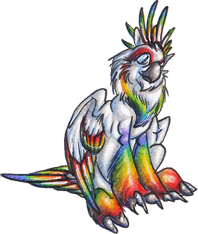 Special markings/colors: Usually overall pale coloration, with more intense colors on the spine-tips and hair. Abilities: Illiayrs have developed echolocation, enabling them to easily navigate underground, especially when their glow has faded due to decreased lichen availability. Illiayrs are very sensitive to sounds and speak very quietly. How to breed: When an Illiayr is bred with an Illiayr the foal will always be an Illiayr. However, any Samanayr with the required Illiayr traits can also be considered an Illiayr, regardless of parentage. Origin: Aeronayrs spend the vast majority of their life on the wing and only recently made a reappearance. It's thought they were originally Lamanayrs that underwent dramatic magical alterations to adapt to life in the air. 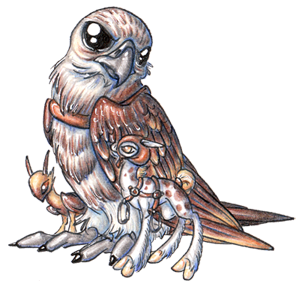 Special traits: Aeronayrs are usually feathered, draconic, or a combination of the two. All Aeronayrs have a beak designed for catching flying insects, long wings (feathered or draconic), wing claws, talons, wyvern (feathered or draconic), a feathered crest or fin mane, and a feathered and/or fan tail. Special markings/colors: Coloration varies but all have light/pale undersides. 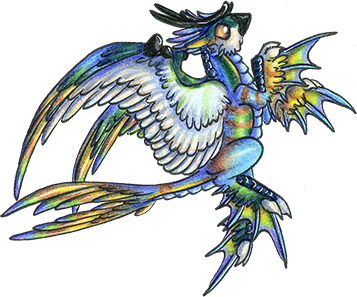 Abilities: All Aeronayrs are able to communicate with each other telepathically, similar to the dragonets' ability but with more complex thoughts. They are not able to speak the Samanayr language but can learn to understand it, and they are able to send thoughts to non-Aeronayrs, although with mixed results. How to breed: When an Aeronayr is bred with an Aeronayr the foal will always be an Aeronayr. However, any Samanayr with the required Aeronayr traits can also be considered an Aeronayr, regardless of parentage. Aeronayr hybrids may or may not have the telepathy ability but it can only be passed down from a full Aeronayr parent. Origin: A failed experiment of the human mages, like the Amanayr'sa'kriens, the sa'kriens are bloodthirsty and territorial. They were created magically. Special traits: At least one horn, and talons or long claws instead of hooves. Many of them are also omnivores or full carnivores, with sharp little teeth. Special markings/colors: Horns, eyes, and talons are always blood red. How to breed: Two Sa'kriens will always produce Sa'krien foals, but if one parent is not a Sa'krien there is about a 50% chance the foal will not be one. A Samanayr is either a Sa'krien or not: there are no Sa'krien hybrids. Many Samanayrs are reluctant to include Sa'kriens in their Songs due to their aggressive nature. Origin: These Samanayrs started appearing after contact with the Sharians, and are created with their help by way of magic. Special traits: An Integrated is basically a regular Samanayr that has at least one non-organic body part, sometimes several. These parts can be made of a variety of materials - glass, wood, metal, etc. Abilities: Varies by integrated parts. How to breed: Since an Integrated's non-organic parts are not genetic, they will not pass on to their offspring. However, if the missing parts are a result of a genetic defect, their offspring may have that as well and may consider getting a similar integrated part. Some particularly devoted foals may also willingly have body parts replaced with Integrated materials in order to honor or emulate their parents. Origin: The first Rider appeared recently at the Song of the Rainbow Hotsprings. All that's currently known about their origin is that they come from the far west, well in or even past the human lands. Special traits: All Riders have cropped and trimmed manes, tails, and foot tufts. A Samanayr with wings or other large appendages would not make a suitable Rider. How to breed: Nothing is known right now about how Riders are chosen and trained, and whether all or some of the offspring of a Rider will also become Riders. Because there are no magical requirements and minimal physical requirements, in theory it could be possible for any Samanayr to become a Rider. Notes: All Riders have two companions - an unnaturally large bird (usually a raptor) or a land-bound mount (such as an Oquieas) and at least one dexterous Kreenasa dragonet. Riders consider the mounts partners, rather than pets, and are able to communicate with them through a language that only Riders share. The dragonet assists the Rider with tasks it is unable to perform, such as fastening buckles, packing and unpacking bags, and manipulating objects. Although the first Rider has kept fairly quietly on the subject of his past, he has revealed that a Rider can be introduced to its partner any time after the yearly shed. With an avian mount, the bird is usually newly hatched, and although its raising is left to its parents, the Rider begins its training with the bird before it's fledged. How the large, intelligent birds came to be, the exact training methods, and other details have not yet been shared. Origin: A tribe of Tribals were encountered randomly on the plains by another group of Samanayrs. After the tribe chased the interlopers away, they decided that it could be entertaining to seek out lands beyond their plains, and several left their homeland seeking adventure and treasure. Special traits: Tribals don't have any specific physical traits, but they do tend to wear many accessories and style their hair into dreadlocks. Special markings/colors: Bright, bold colors and markings. How to breed: Because Tribal is more of a mindset than a set of traits, any foal can be raised in the Tribal lifestyle and ideals, which will mean they grow up to be a Tribal. If they're raised like other Samanayrs, a Tribal's offspring will just be a regular Samanayr. Most Tribals choose to raise their foals to also become Tribals, and a regular Samanayr usually cannot raise their foal to be a Tribal. Notes: Tribals tend to keep to open areas and prefer the company of their own species, often traveling together in close-knit tribes of their own species. They're a passionate species and can be incredibly territorial, and they're always on the lookout for new trinkets and adventures. Origin: Kodylas were bred by the Sharians who decided that Samanayrs would make ideal pets. Since their creation, the Kodyla population has remained small, and care has to be taken that excessive inbreeding doesn't occur. Special traits: Kodylas have the magically-created longhair trait, and extensive foot tufts. Abilities: Kodylas are, for the most part, pampered and spoiled pets. They usually live with Sharians, and few would consider an outdoor hotspring to be an appropriate home. How to breed: A true Kodyla is only produced when a Kodyla is bred with a Kodyla. Even if a Samanayr has Kodyla-like traits, if its parents are not also Kodylas it can be difficult for it to be accepted into Kodyla society. This is especially problematic for Kodylas whose parents made them such with the use of modiems or other magical items before the foal was born. Breeding restrictions: Kodylas will rarely 'lower themselves' to breed with a non-Kodyla species. 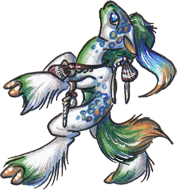 Kodylas prefer casual dalliances and are not willing to commit to Songs, so all Kodyla breedings occur outside of a Song. Origin: The origin of Sa'grisayrs is unknown. Magical involvement is suspected, since the beak trait originated with Sa'grisayrs and could not have developed naturally. Special traits: All Sa'grisayrs have a beak, talons (at least on the forelegs), and feathered wings. They may also have a feathered crest and feathered tail. Abilities: Sa'grisayrs are omnivores, though their exact diet is up to the individual. Most incorporate fish and insects into their diets, and diets can range from mostly fruits, plants, and vegetables to small animals, depending on the individual. How to breed: When a Sa'grisayr is bred with a Sa'grisayr the foal will always be a Sa'grisayr. However, any Samanayr with the required Sa'grisayr traits can also be considered a Sa'grisayr, regardless of parentage. Origin: Minayrs appeared at the Song of the Rainbow Hotsprings some years ago. Their teleportation ability is completely unique but they are either unwilling or unable to share how they developed it. 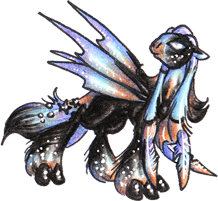 Special traits: All Minayrs are mini with feathered antennae, faery wings, large ears, talons, and a fan tail. Abilities: Minayrs can teleport short distances. Their target must be in their line of sight and the space unoccupied. How to breed: A true Minayr is only produced when a Minayr is bred with a Minayr. Even if a Samanayr has all of the required Minayr traits it is not considered to be a Minayr unless it also has the teleportation ability. Minayr hybrids may or may not have the teleportation ability but it can only be passed down from a full Minayr parent. The only way to get a pure of whichever species is to breed two of the same species together, or use magical breeding items to cause the foal to be the desired species. Even if two Samanayrs with a variety of traits breed and happen to have a foal with all of the required traits for a particular species, the foal would still be considered a regular Samanayr or a hybrid. Hybrids are created when two Samanayrs of different species breed, and usually have physical characteristics and abilities from both parents. The actual hybrid species name is a combination of the parent species. For example, a Northern and a Lamanayr would produce a Lamanayr-Northern hybrid. When a hybrid breeds, the species of the foal will be determined as if the hybrid parent was just a regular Samanayr. For example, if a Lamanayr-Samanayr hybrid bred with a Samanayr, the foal would be considered a full Samanayr, and if a Kirin-Northern hybrid bred with a Lamanayr, the foal would be a Samanayr-Lamanayr hybrid. Exceptions: The magical species - Mystic, Misery, Mystery, Healer, Shifter, and Sibyl. These species are more like traits than species, and a foal will either be one or not. You cannot have a hybrid of one of the magical species. Some species can be combined to create a species combination, such as a Northern Lamanayr (pictured right) or a Desert Sa'krien. A combo-species Samanayr has all of the traits, features, and abilities of at least two species and, unlike a hybrid, is considered a member of both of these species. It's not known how combinations of species occur, because usually breedings between two different species results in a hybrid. It may be a matter of coincidence, in that the foal inherited all of the required traits, features, and abilities from both parents, or it may be done magically. In either case, it's up to the Samanayr to declare that it's a combination of species, since otherwise it will just be considered one or the other with some additional traits. Some species are more frequently used in combinations than others. Mystics are a common combination species, since any non-magical species can be a Mystic in addition to whatever their other species is. The 'regional' Samanayrs can also be easily combined with other species - you could have a Northern Lamanayr, a Desert Tribal, an Illiayr Sa'grisayr, etc. It is extremely rare for a combination to be of more than two species, but it is possible. You could, for example, have a Northern Lamanayr Kodyla Mystic, but such a combination would be considered almost impossibly rare. When a combo-species Samanayr breeds, unless it's breeding with another Samanayr that has the same combo-species, its offspring will be considered hybrids. A combination Samanayr's rarity is one step up from the rarest species in the combination, to a maximum of very rare. For example, a combination with one common and one uncommon species would be rare.